CVNC: An Online Arts Journal in North Carolina | Mallarmé Chamber Players Present Series Concert "Leipzig Locals"
Mallarmé Chamber Players Present Series Concert "Leipzig Locals"
This preview has been provided by Mallarmé Chamber Players. Durham-based Mallarmé Chamber Players dives into the new year a series concert Leipzig Locals on Sunday, February 3, 2019 at 2:00 PM at First Presbyterian Church at 305 E Main Street in Durham. Leipzig Locals is a concert made up of music by J. S Bach's contemporaries, all whom have a Leipzig, Germany connection. The program showcases the works of German composers Christoph Graupner, Johann Gottfried Müthel, Carl Friedrich Abel, and G.P. Telemann alongside Bach's Sonata in E Minor for violin and continuo. 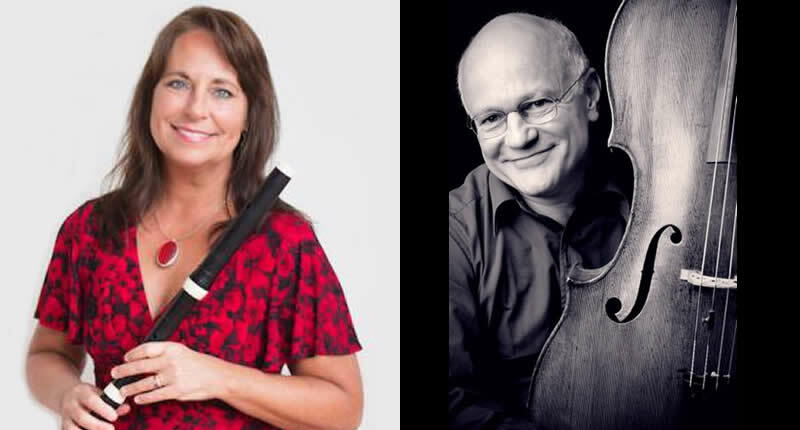 This concert will feature period instrument players Kathie Stewart from Apollo's Fire on the traverso (baroque flute) along with renown cellist/gambist/conductor Jaap ter Linden. Joining in with a program are local baroque heros violinist Nicholas DiEugenio and harpsichordist Elaine Funaro. Following the concert Kathie Stewart will give a master class on Baroque performance practice at the concert venue, First Presbyterian Church in Durham. This event is given in partnership with the Raleigh Area Flute Association. Jaap ter Linden will give a class to cellists at UNC-CH at 5 pm in Person Hall. Both classes are open to the public. Mallarmé Artistic Director Suzanne Rousso says "This program is exciting as it is introducing old but new-to-you works by composers Müthel, Abel and Graupner, and more familiar works by Bach and Telemann." These composers all had some personal relationship with J.S. Bach; Müthel was a student at the very end of Bach's life and was said to attend Bach on his deathbed; Abel studied with Bach in Leipzig while a young student at the St Thomas School. Graupner was not a student but a colleague who turned down an offer of the position as cantor at the St Thomas School (as did Telemann), paving the way for hiring of J.S. Bach. Telemann and Bach were contemporaries and friends; Telemann was godfather to Carl Philip Emmanuel Bach, Johann Sebastian's second son. At the door 30 minutes in advance of the concert if still available. The Mallarmé Chamber Players are a flexible ensemble of professional musicians based in Durham, North Carolina, whose mission is to enrich the lives of their community through outstanding chamber music. The ensemble distinguishes itself by its innovative educational programs, its commitment to creative collaboration with other organizations, its creation of significant new work, and its dedication to serve a diverse population. Mallarmé annually presents a series of concerts that features great, diverse, and multidisciplinary chamber music. Mallarmé performs everything from Bach with period instruments to commission and performing brand new works. In 2010, Mallarmé released, to great acclaim, a cd on Albany/Videmus records of chamber music by African American composers. Mallarmé is unique in that we do not work with a small core of musicians, but instead use the wonderful musical talent North Carolina has to offer to perform with the ensemble depending on the needs of the repertoire. Most of Mallarmé's musicians are members of professional organizations like the NC Symphony, freelance players or faculty members of the numerous institutions of higher learning. Mallarmé is a non-profit, tax-exempt, 501(c) 3 organization. The 2018/19 concert season is made possible in part by grants from the Durham Arts Council's Annual Arts Fund and the North Carolina Arts Council.